The sequel to the excellent Diablo-clone-on-a-budget will be just as budget-friendly as its predecessor. Back in the day, we recommended Torchlight as an excellent (and cheap) stopgap for those awaiting Diablo III. Now, D3 is right around the corner and Torchlight 2 has no release date in sight. Even if developer Runic Games can't beat Diablo to the proverbial shelves, it'll certainly beat it in price - today Runic announced that Torchlight 2 would be just as inexpensive as the first game. For those of you who can't remember back to the distant mists of 2009, that means that Torchlight 2 will retail for $19.99 (Â£14.99 / €18.99). The game might not have a release date, but you can now preorder it at Steam or with Perfect World Entertainment. Steam preorders will also come with a copy of the first Torchlight for the low, low price of absolutely free, so that's kind of a no-brainer. Even without a release date, Runic maintains that the game is just about finished. 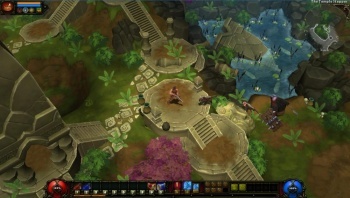 "We're pretty excited to see Torchlight 2 approaching completion, and can't wait to get it into players' hands to see what they think," said team lead (and company president) Travis Baldree, "It's been a long haul, and taken more time than we expected, but we hope you'll agree that the additional time has been worth it. Thanks for sticking with us!" Indeed, Torchlight 2 has been in development for around two years at this point - significantly longer than the rapid development of the original. It's good to see that even with the dramatically increased scope of TL2, Runic is still committed to keeping the game affordable for gamers on a budget - and gamers prone to making impulse purchases. Like Runic told The Escapist back in 2009, you can pick up Torchlight 2 and order a large pizza to eat while you play, and still have about $20 left over from the price of a big-budget full-price release. Then, you could spend that $20 on another copy of Torchlight 2 and have a LAN party with a friend! I mean, you're not going to eat that whole pizza by yourself, are you?